There's a lot that happens to your body when you feel anxious, stressed, or depressed. The usual instinct is for your body to tense up. The muscles become tense because your brain is sending your body the message that there is danger around and to protect you. Your body is getting ready to endure a fight, to protect vital organs, and to run. This instinct is great when you are in actual physical danger but now-a-days most danger does not require this type of intense response. These days you might be at work overwhelmed by the amount of tasks you need to complete or running late to meet your friend or overwhelmed by a social interaction. These types of situations don't require your body to get ready for fight or flight. You might not even notice how stressed or anxious you are until the end of the day when your shoulders are hurting, or your jaw hurts from clenching it too much. 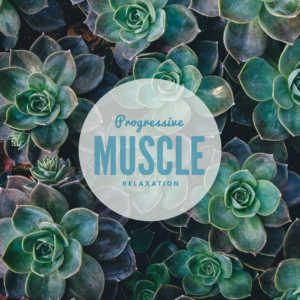 Progressive Muscle Relaxation is a relaxation skill that we teach in Cognitive Behavioral Therapy to help relax and calm your muscles. It is an exercise that has you go through different muscle groups, tensing them for a few seconds, and then relaxing them. The reason why it has you tense your muscles before you relax them is to draw awareness to that muscle group so that you can focus on each muscle group at a time as you relax. It's a skill you can use in most environments and is usually rather subtle so most people around you will not notice that you are doing it. Here is how it works. The list below is an overview of most of your muscle groups. For each group, start by taking a deep breath in while tensing that muscle. Hold your breath for 4 seconds while you hold onto the tension. Then, as you breath out slowly, allow that muscle to relax while you imagine the tension to leave that part of your body. Repeat this step with each muscle group that is listed below or muscles that you can think off. Try doing this exercise at least once a day for two weeks before you decide on its efficacy in reducing your anxiety. Sometimes it might take a while for this skill to work. Try it out in the morning before you get ready for your day, or while you notice tension, or in the evening before you go to bed. See what time of day and in what situation this skill works best for you. You know your life and your body best so you will be able to tell when to use this skill. Sweet internet site, super style and design, really clean and use genial.